12 Scholarships worth $2000 each! Ten scholarships will be awarded for the 2019-2020 school year. 6 Scholarships are available for the sons/daughters of Illinois cooperative members for any two or four year accredited college in the United States. 1 Scholarship is reserved for the son/daughter of an Illinois cooperative employee or director for any school in the United States. 4 Scholarships are available for the sons/daughters of Illinois cooperative members, employees or directors for any Illinois community college. 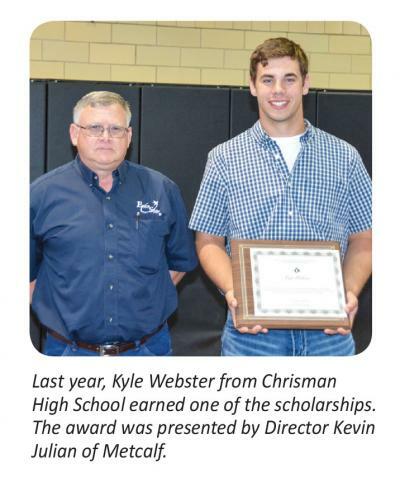 1 Scholarship is reserved to help pay for costs to attend lineworker’s school conducted by AIEC in conjunction with Lincoln Land Community College in Springfield, Illinois. This Scholarship is for the son or daughter of an Illinois Cooperative member, employee, or director; an individual who has served or is serving in the U.S. armed forces or National Guard; or an individual enrolled in the Lincoln land lineworker’s school. © 2015 EnerStar Electric Cooperative. All Rights Reserved.